Early Summer Sale! $3850 June 9th-16th Sleeps 10! Stargazing. Done any lately? Enjoy STAR GAZER- our family friendly custom-built home completed April 2009 and nestled in desirable Cape Fear Station. TWO Master Bedroom Suites makes our home perfect for two families. 'Star Gazer' has a reverse floor plan, which utilizes the second story for cooking, dining, and Great Room gathering while enjoying Maritime Forest views as well as the calming sounds of nearby ocean waves. Both floor offers its own spacious Master Bedroom Suite with king-size bed as well as private screened porch access. Master Baths feature a Jacuzzi soaking tub and an over-sized shower featuring body sprays for the ultimate in relaxation. Two additional bedrooms are on the first floor. The third bedroom has a queen-size bed while the fourth bedroom has something all children enjoy--a unique full-size bunk bed with a twin trundle able to accommodate four happy sleepers. All four bedrooms include custom tiled en suite baths, ceiling fans, and flat screen TVs. Find pleasure in numerous amenities including custom home furnishings, hickory hardwood flooring, a gourmet kitchen featuring upgraded appliances and natural maple cabinetry complemented by granite counter-tops. This lovely home offers a total of five porches, three of which are screened to allow eat-in dining, as well as a 'Star Gazing' deck for sunbathing during the day and stargazing in the evening. An infant portable crib, high chair, and a safety gate are available for use during your stay. Laundry room is on the first floor with a handy mud room both at the rear entryway. An enclosed outside shower sits between the two-cart garage and back entrance, allowing a fun way to get cleaned up after a great day at the beach. The second floor Great Room, a primary gathering space, features a custom sectional couch with generous seating, over 30 family games and puzzles, and a 46-inch flat screen TV hidden away in a cabinet above the fireplace. Adjacent to the Great Room, a hand-made cherry dining room table able to seat 10 occupies the kitchen/dining room area. Cathedral ceilings in these three rooms allow wonderful lighting throughout the day. 'Star Gazer' encompasses a wooded corner lot, which affords privacy and a distinct sense of closeness to nature. Yet, this special island home is convenient to Bald Head Island's gourmet market, boutique shops, The Shoals Club, Bald Head Island Country Club, The Island Conservancy, and the Marina. 'Star Gazer' is a brief two minute golf cart ride or an 8 minute walk to unparalleled East Beach. The Shoals Club is very close by and which features excellent dining, two swimming pools, and direct beach access. Included with your rental are two golf carts--a 4-seater and 6-seater, and 6 bicycles to ensure relaxing travel while exploring uniquely beautiful Bald Head Island. After moving to Charlottesville,Virginia from the San Francisco area in 2002, our family longed to be near the ocean. We felt as though we had struck gold when we discovered the beauty of Bald Head Island. Our children and their friends love everything about the island and look forward to every visit. My husband & I were captivated by the uniqueness of Bald Head Island. After visiting, we decided to purchase land in Cape Fear Station and build a home on the island. We finished STAR GAZER in April 2009 and it was absolutely worth the wait! Together with our children, friends, and family members, we enjoy the pristine beaches immensely, as well as exploring the island on a golf cart, bicycle, or on foot. The brief ferry ride from Southport provides a much needed means to relax and anticipate the joy of what lies ahead. 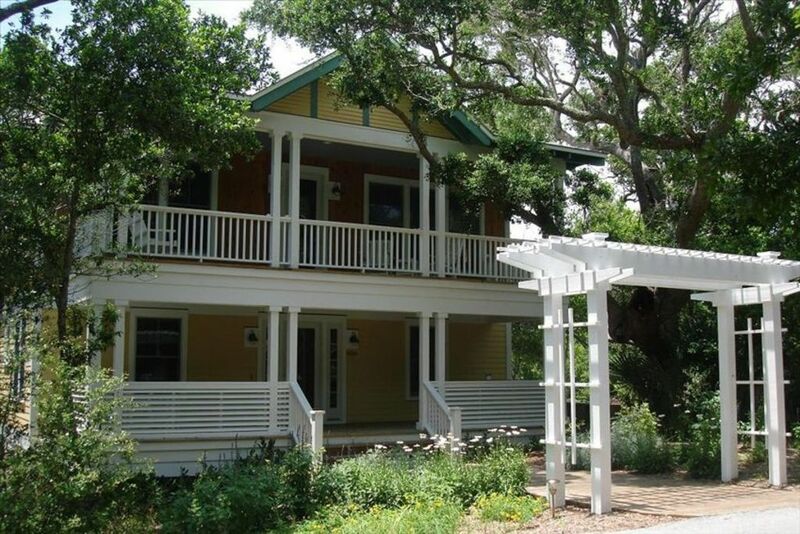 Both The Shoals Club & Bald Head Island Club have Fitness Centers. Great Room Opens to Kitchen with Breakfast Bar and Dining Room w/ Gas Fireplace+wet bar. All new KitchenAid Architect Series II appliances. Refrigerator and additional beverage cooler & wine cooler. Every bedroom + the Great Room have flat screen TV's. A collection of Beach Toys are kept in the Garage. Available for Rental at Riverside Adventure Company or Coastal Urge on the island. 6 Adult Bicycles are included. Available for Rental through Coastal Urge (paddle boats) or Riverside Adventure Company. Water Sports are offered through Coastal urge and Riverside Adventure Company. Bald Head Island Country Club offers tennis to Temporary Members. Bald Head Island Country Club has a beautiful golf course for use by Temporary Members. The Shoals Club and Bald Head Island Club have heated pools available to temporary members. Reverse floor plan; two separate & spacious Master Bedroom Suites. All bedrooms have en suite bathrooms. Six porches; 3 are screened-in.